Written by gabby on March 27, 2019 . Posted in Blog, Japan. I haven’t met anyone who have played the Nintendo game Mario Kart and then say they didn’t like it. The game is hilarious and exciting for people of all ages. 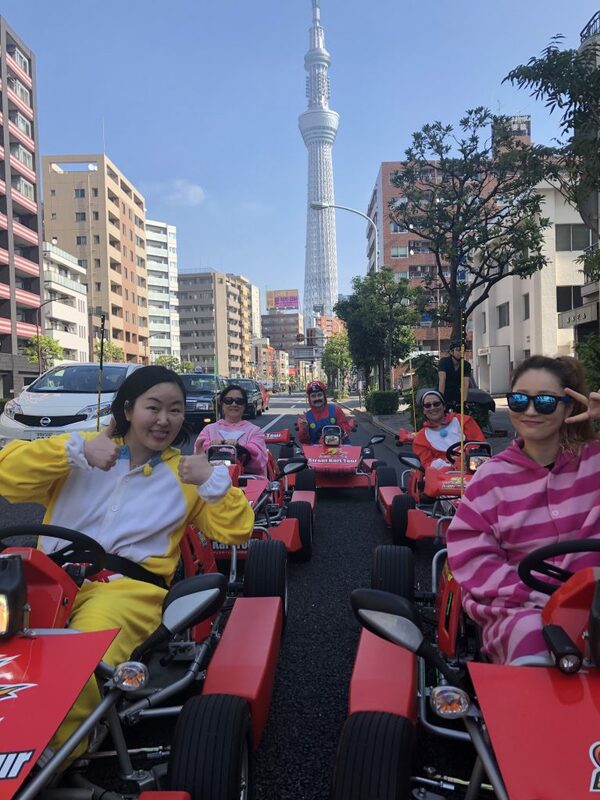 Now, would you believe me when I say that it’s possible to dress up in costumes and drive Go-Karts through the streets of Tokyo? The company is called MariCAR and I had never heard about them until Nintendo filed a lawsuit against them. Funny how negative press can increase a company’s revenue. 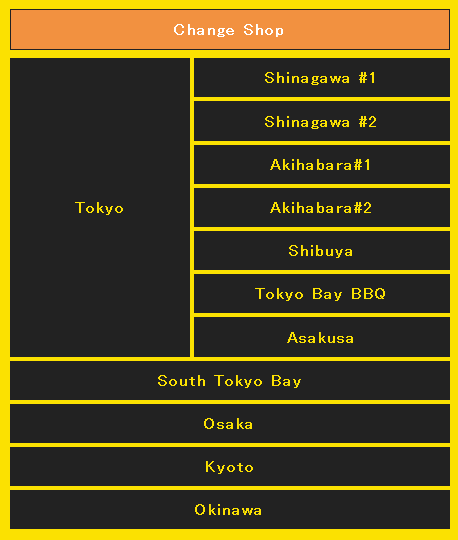 It all started in Tokyo, but have now spread to other cities in Japan. The graphic below shows you the different locations run by the MariCAR company. We booked this activity before our trip. As we were staying close to Akihabara, we selected that location. You can opt between a 2hr and 4hr tour. We chose the 2 hour tour, since we had quite a busy schedule in Japan, and 2 hours seemed sufficient. I made our reservation through the LINE app, which was very easy and used by every Japanese person I know. At the time we booked, we also got a discount if we promised to write about it on social media (hint, hint). Remember everything they tell you, such as getting an international driver’s permit before your trip, bringing your passport to your appointment, and showing up 15-20 minutes before your scheduled tour, so you can prepare. And prepared we weren’t. We didn’t pay enough attention to the different locations. Little did we know that MariCAR had two locations in Akihabara, and we showed up at the wrong one. Fortunately, the 2nd location was not too far off, so we were able to speed walk there in time for our appointment. Once we were there, we were instructed to sign a liability release form, use the bathroom, and pick our costume. They had the popular Mario costume but also a plethora of other characters. To be honest, I didn’t know half of them. Then it was time to depart. They rolled out the go-karts on the street, we got seated, made some adjustments, got a quick tutorial on how to drive these things and instructions on what to do and not to do. The main thing to remember was to always stay together as a group. The first push of the pedal, launching me into the streets of Tokyo, gave me an adrenaline rush almost comparable to the first time I went sky-diving. It was a fantastic feeling! 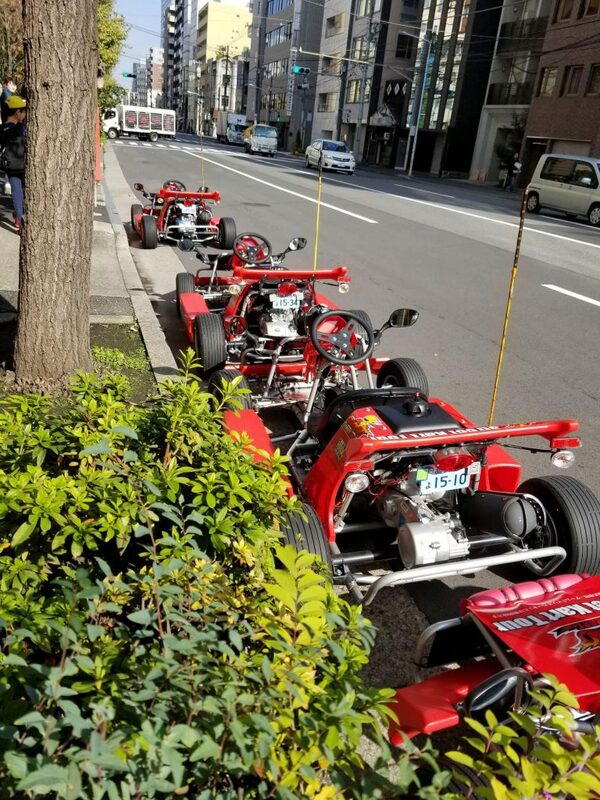 I love go-karts, and driving in the city of Tokyo was amazing. I couldn’t wipe the smile off of my face. What made it such an experience was also that people on the side-walks and cross-walks would cheer, wave, and call out the names of the character costumes we were wearing. Japanese people are reserved, but they like to go crazy about cosplay and costumes. This is not only about driving a go-kart and dressing up. Remember, this is also a tour. Our guide, who drove up front, told us about the districts we were driving through, as well as pointing out certain landmarks and architecture. It was interesting and an added value, but it was the thrill of driving that got most of my attention. As we got the nod that it was time to head back to the depot, I realized why people book the 4 hour tour. Our 2 hours wasn’t too short, but I also don’t think 4 hours is too long. Now regarding that lawsuit. Nintendo claimed MariCAR infringed on their copyright, sounds too close to their Mario Kart and that the use of costumes even makes it more apparent that there could be a confusion that it’s a Nintendo operation. The last thing I heard is that MariCAR is that they settled the suite by paying a fine and that the business name will change. I also want to point out that this activity does not come without risks. Japanese are good drivers, but as I was driving next to a huge truck I realized that one wrong turn and we would be crushed. Fortunately, I have not yet heard of any serious accidents involving these go-karts.